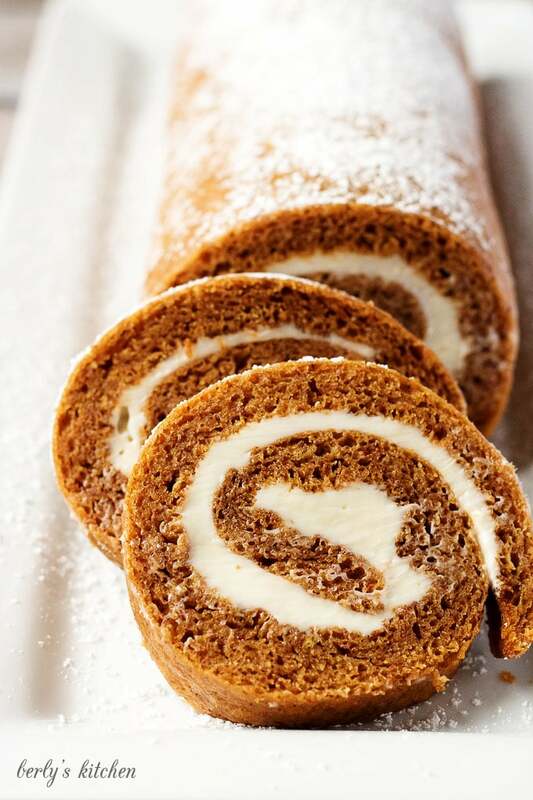 Grandma’s Pumpkin Roll recipe is one of my family’s favorites. Sweetened cream cheese filling rolled in a light, and moist pumpkin cake makes this dessert unforgettable. Before my family and I moved to Florida, we lived near my grandmother. Each year, she made several pumpkin rolls and sent them home with various family members to enjoy over the holidays. Everyone in the family absolutely loved them. John and I always ended up with at least two at our house. He usually ate them because I wasn’t a big fan of pumpkin. One year, he talked me into trying a bite. Grandma’s pumpkin roll recipe was so good that I wanted to be able to continue to make them long after she was gone. The next time we visited Grandma, I asked for her pumpkin roll recipe. My grandmother was thrilled to share her recipe with me, and I’m so glad she did. Over the years, I’ve practiced making her pumpkin roll recipe but couldn’t get the technique quite right. The pumpkin cake usually ended up in a big heap of crumbs and was a huge mess. 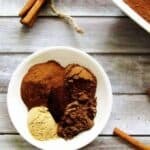 If you’ve read my earlier posts, this year is the year I’m learning to make pumpkin related recipes like Pumpkin Spice Muffins, and Pumpkin Pie Spice. 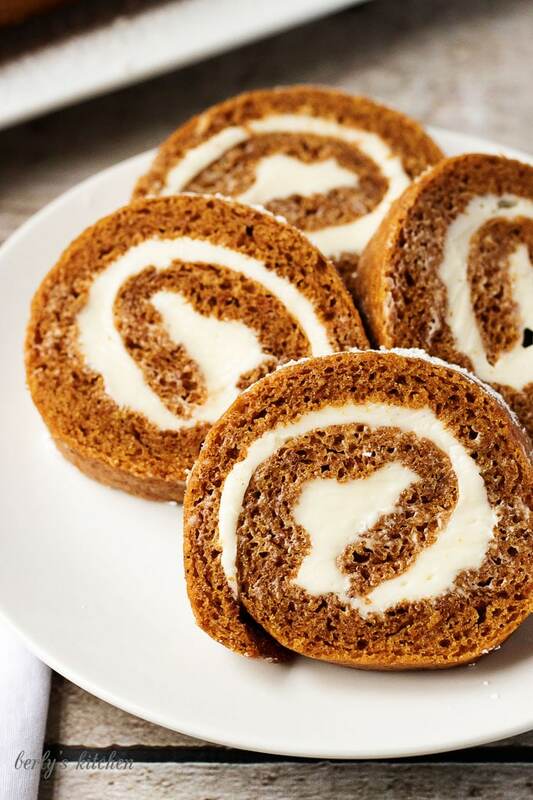 How could I get by without baking Grandma’s pumpkin roll recipe? This time, I followed the directions better and used the right materials. Plus, a little experience never hurts. The result was a moist, cream-filled, pumpkin roll almost as good as Grandma’s. Grease a jelly roll pan or baking sheet with butter. Cover the pan with waxed or parchment paper. Make sure the paper stays in place by pressing down, so it sticks to the butter. Apply more butter or cooking spray to the top of the paper. Preheat the oven to 375 degrees. Add the sugar, pumpkin, baking soda, flour, pumpkin pie spice, and eggs to the bowl of a stand mixer. Use the paddle attachment, and mix on low until combined. Pour the batter onto the prepared baking sheet and use a silicone spatula to smooth it into one even layer. Place the pan in the oven and bake for 15 minutes. The cake will rise slightly and should spring back when touched. Do not overbake or the edges will harden. While the cake is baking, take a large kitchen towel and liberally sprinkle it with powdered sugar. After the cake bakes, remove it from the pan leaving the waxed or parchment paper attached. Flip the cake upside down on the kitchen towel (paper side up, cake side down touching the towel and powdered sugar). Carefully peel off the paper taking care not to tear the cake, then discard the paper. Roll the cake up with the kitchen towel inside. Allow the cake to cool completely while still rolled in the towel. 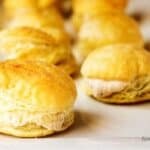 In the meantime, you can make the cream cheese filling. Add the softened cream cheese, powdered sugar, butter, and vanilla the bowl of a stand mixer and use the whisk attachment to combine. If you want to add chopped pecans, remove the bowl from the mixer and gently fold them in. Store the filling in the refrigerator until you are ready to fill the cake. After the cake cools, carefully unroll it, but don’t force it to lay flat. Use a spatula to apply the cream cheese filling to the interior of the cake. Smooth it out so it’s one even layer and covers to all the edges. Roll the cake back up with the filling on the inside. Cover the pumpkin roll with plastic wrap and place it in the refrigerator for 1-2 hours to set. Once it has set, sprinkle the cake with powdered sugar and slice it to serve. It can be stored in your fridge for up to three days. 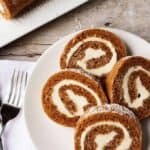 Grandma's Pumpkin Roll is one of my family’s favorite fall recipes. Sweetened cream cheese filling rolled in a light and moist pumpkin cake makes this dessert unforgettable. Grease the bottoms and side of a jelly roll pan or baking sheet (mine was 10 x 15 inches). Place waxed or parchment paper in the pan then grease the paper. Place all the cake batter ingredients sugar through eggs in the bowl of a stand mixer. Use the paddle attachment to mix on low speed until combined. Pour the cake batter into the prepared pan and bake for 15 minutes. Remove the cooked cake from the oven and place cake side down on a clean kitchen towel sprinkled with powdered sugar. Roll the towel and the cake together and allow the cake to cool. Use a whisk to combine the butter, cream cheese, vanilla, and powdered sugar. Use a spatula to spread the filling over the cake but don't try to make it lay flat. The cake will try to roll at the ends. After filling the cake, roll the cake back up and wrap it in plastic wrap. Store it in the refrigerator for 1-2 hours to set. Thanks, Alia! I’m slowly getting better photography equipment. These pictures were some of the first I had taken with it. This brings back SUCH wonderful memories of both my grandmother and my mom! Love classic recipes like this! Your photography is great! This looks so delicious!! Perfect for the upcoming Thanksgiving holiday coming up! YUM!! Gorgeous Kimberly! I love pumpkin rolls, but I lack the coordination to actually do the rolling lol. Oh I love pumpkin rolls! And grandma’s always make the best ones. I’ve made a few myself and the rolling is always the scary part, but it always tastes delicious all the same. THanks so much for sharing your granny’s recipe! Love this for a fall brunch or dessert after Sunday Supper! Thank you, Kathryn! We are glad you enjoyed the recipe 🙂 Have a great day! Kimberly and John, Once again you pictures are amazing. There is nothing like preserving old family recipes. I try to do the same with my mother’s and grandmother’s recipes. Your pictures have really put me in the Fall mode. Looks delicious. Thanks. Thank you, Sam! We appreciate your kind words. It’s a labor of love when creating a beloved family member’s recipe. We are so happy you enjoyed the post. Thank you again for commenting and all your shares on other mediums. Have a great day, Sam! Gramma’s always have the best recipes. 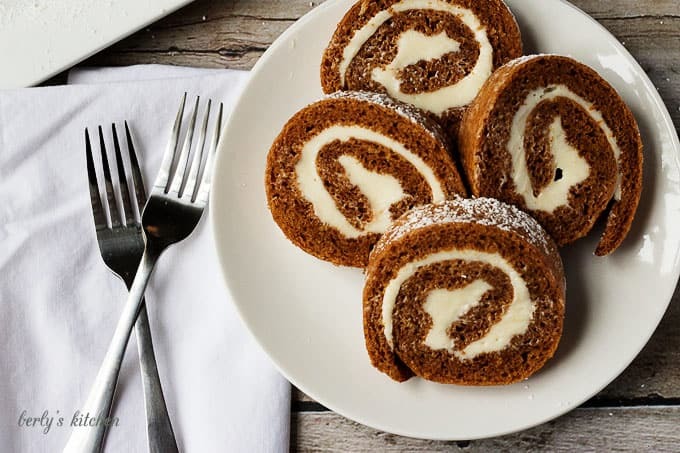 I love summer, but will admit fall is the season of flavour…and this pumpkin roll is the perfect example!! 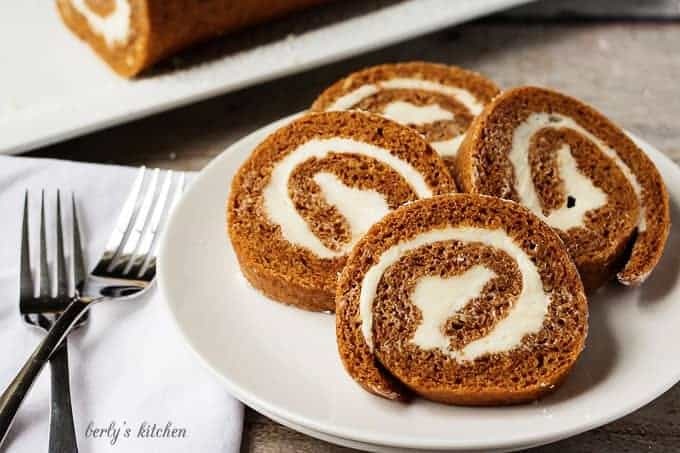 I have never actually tried a pumpkin roll but now I’m thinking I must because this looks delicious! I love a nice pumpkin roll for Thanksgiving! It is so nice you carried on your family tradition. This looks so delicious! I have never made a swiss cake roll before. I should try! I love pumpkin. 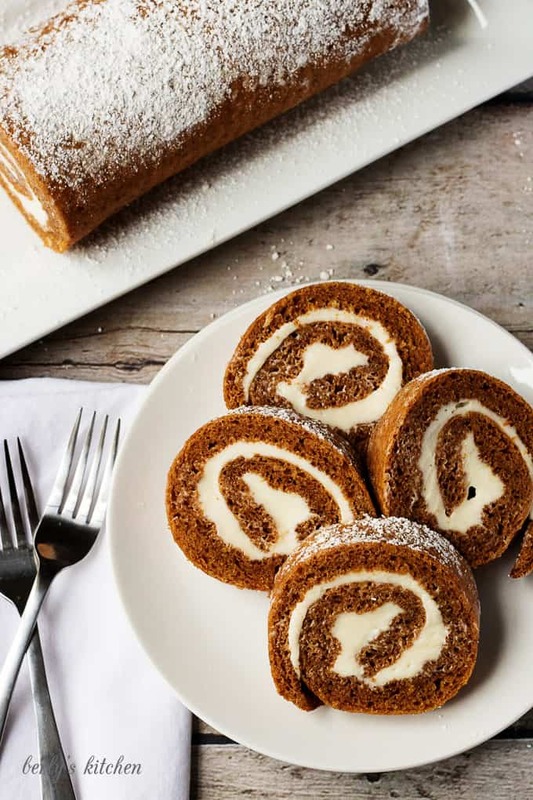 This is pumpkin roll perfection! What a gorgeous way to celebrate the fall. This roll looks PERFECT! I can tell it’s nice and tender – pass me a slice (or 3) please! 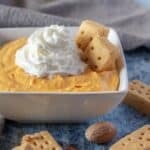 I am sooo excited for “pumpkin season” and this recipe looks like a great way to kick it off. Thanks for sharing! Love this! Your photos are gorgeous and they take me back to when my grandmother and mother would make pumpkin rolls. I was always mesmerized by the technique. One of these years I’m going to give it a try and I’m going to refer back to this post! I always end up with a mess when making rolled cakes like these. Maybe I just need more practice – which is a great excuse to make this cake.